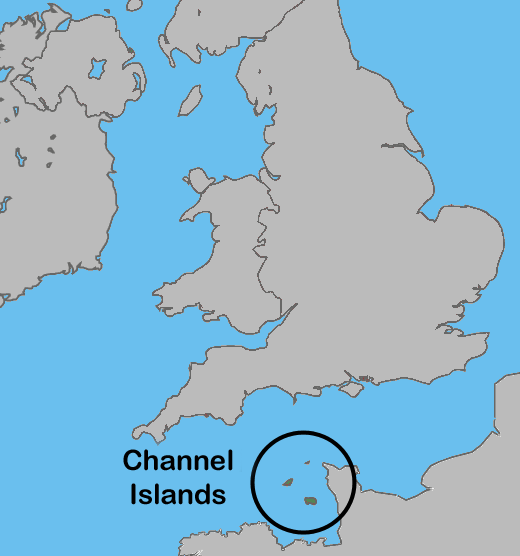 Last summer my husband, Rich, and I spent five days on the Isle of Jersey, one of the Channel Islands in the English Channel. Although they belong to Britain, they are much closer to the coast of France and are self-governed. Our plan was simple – we chose a charming guesthouse and rented bicycles for the week. It was to be my first time cycling for consecutive days, and as our sole means of transport. But since each day’s excursion was only a day-trip, and could be skipped or modified at will, it was a good way to test the waters for a more adventurous cycling trip in the future. Jersey proved to be a cycling haven. The island is only 9 miles by 5 miles in size – it sounds small, but it is criss-crossed by small lanes designated as “Green Lanes” where the speed limit is 15 mph and cyclists have the right of way. The rich greenery proved scenic throughout the island, and the coastal roads provided particularly spectacular views. Each section of the island had its own flavor, sites and geography, providing plenty of variety on our daily travels. And Jersey enjoys a far sunnier and warmer climate than the rest of Britain. Our guesthouse breakfast was bountiful and we savored it sitting outdoors in the garden area, chatting with the other guests. It fueled us for the day, although we always enjoyed a pub stop mid-afternoon for a refreshing half pint of English cider. By dinner time we were ready to sample the variety of local restaurants. While Jersey is expensive, and reported to be a destination for the wealthy, our needs were simple and we could enjoy the lavish venue on a relatively more modest budget. The verdict? A great vacation and cycling success. I’m ready for the next challenge! Click on any picture to view as a slideshow. This entry was posted in Keeping Fit, Travel and tagged Channel Islands, Cycling, Isle of Jersey, Travel by Molly. Bookmark the permalink.